Prophetic words by Zubeidat Tsarnaeva, loving mother of the accused in an interview with cable news network RT. How is this statement being so overlooked by main stream media. Here we see the FBI encouraging everyone to forget everything else that’s questionable in all the footage of that day and only focus on who they tell you to. “Move along. Nothing to see here”. 2) The FBI at first denied that they knew who the two young men pictured were. 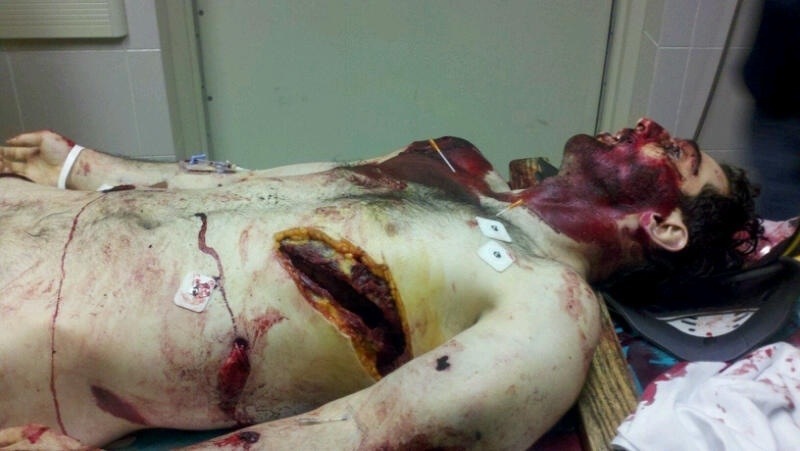 But later were forced to reveal to the world that they had in fact made contact, interviewed and ran detailed inter-agency background checks with the now-deceased Boston Marathon bombing suspect Tamerlan Tsarnaev two years ago and failed to find any incriminating information about him. In a recent turn of events the younger brother who suffered a throat wound and is unable to speak is now conscious and communicating with “authorities”. This obviously means he is writing to the people interviewing him. No doubt the FBI. After seeing 3 examples of how FBI lies right to your face, are you now going to believe anything else they say? What are the chances our young bombing suspect is going to have legal representation? Was he read his MIRANDA rights? No doubt he’s been labelled an “enemy combatant” meaning he now has no rights. Where’s the proof? These two boys are guilty? Especially when there’s evidence suggesting, even proving otherwise. There’s plenty of questions left unanswered. Here’s some obvious ones being overlooked. Perhaps intentionally by main stream media and investigators. 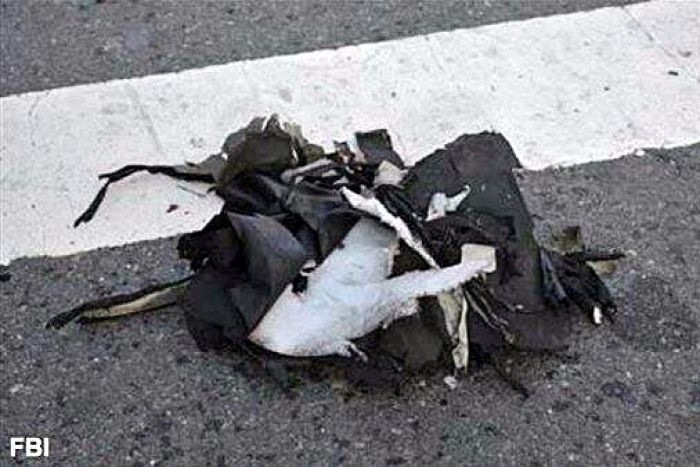 A BLACK backpack blown apart. A bit of grey along the shoulder straps. Some white tags and the fluffy lining that’s normally sewn in for padding. Look closely. 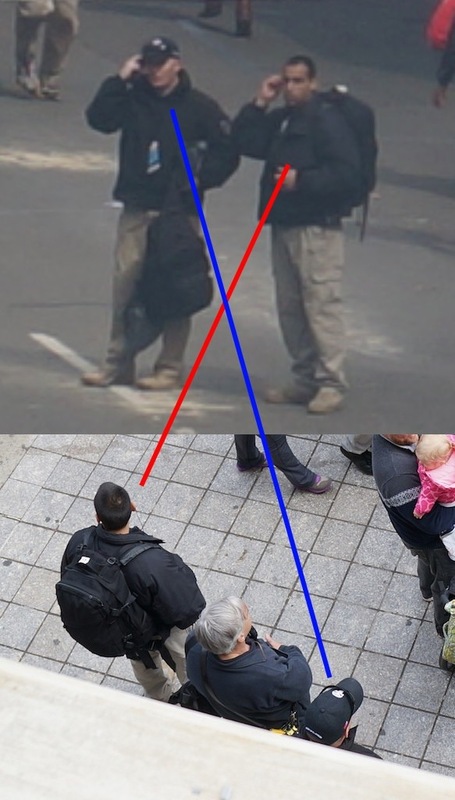 Do either of the backpacks worn by the boys look like the blown apart one? The first one maybe (That’s a BIG maybe). Or does it look more like this one? Hmmm…no wonder the FBI publicly stated, and I refer to the quote above, “Other photos should not be deemed credible and unnecessarily divert the public’s attention in the wrong direction and create undue work for vital law enforcement resources”. I didn’t realise they changed their name from the Federal Bureau of Investigation to the FBM (Federal Bureau of Misinformation). Incidentally see here for more on just who these tan pants, tan shoes, black jackets, black backpack, ear piece wearing goons are. 2) Yes. We’re only on 2! The amputee photos. We’ve all seen the image of the man with his legs blown off being carted off in a wheelchair. I’m not going to go into details about the wound itself, but rather get you to look at the below photo. Is he visible here? Not to me he’s not. Pay attention to the centre. 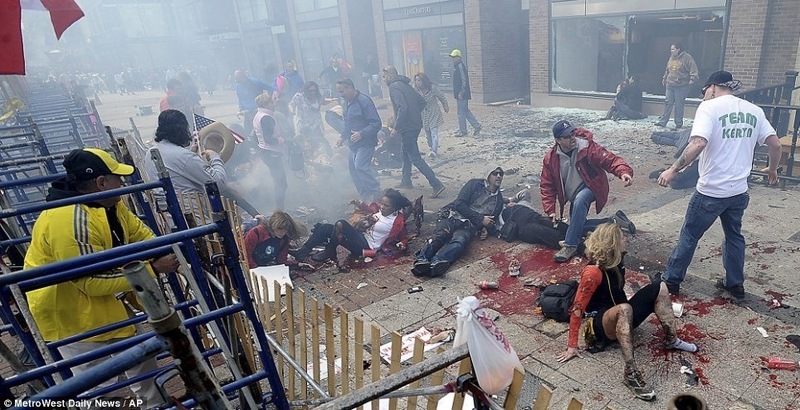 I see red headed woman on the left lying on the ground, a black woman (centre) lying on her back but sitting up a bit and a guy lying on the ground in a hood and sunglasses on the right. Same red headed woman in the same pose. The guy on the right is now lying down being tended to by 2 people. Ahhh where did the black lady go? And where did Mr Amputee come from? AND the most curious point…why is no one around him tending to him? Surely in a triage situation like this he is a top priority. I honestly don’t know what to make of this. 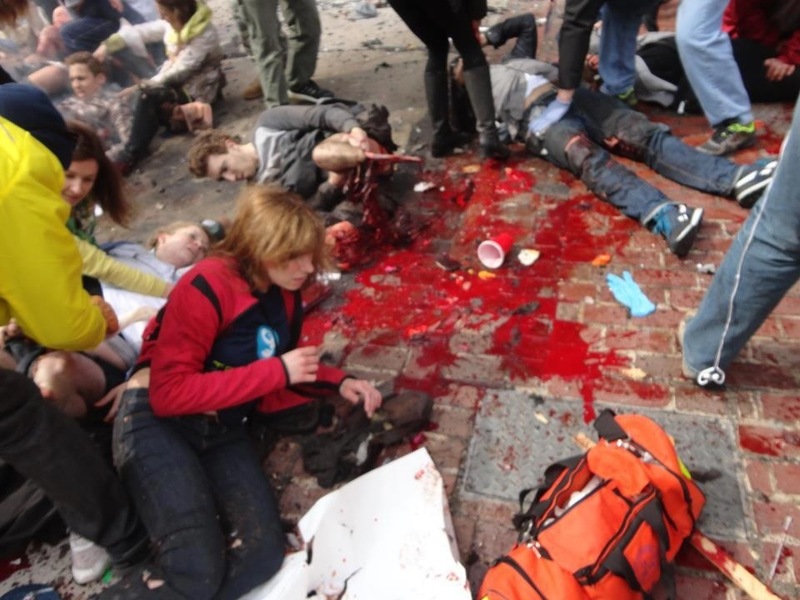 Some sites are saying its a staged event and crisis actors were used. Maybe. Perhaps this was originally going to be a training drill like eyewitness Alistair Stevenson reported. Perhaps the two young suspects were groomed by the FBI to help in this drill or more sinisterly set up as the fall guys like their Mother, Father & Aunt claims? 3) The Naked Man. Who was he? Watch this news report and judge for yourself. Innocent bystander who just happens to look a lot like the older brother or the older brother himself? 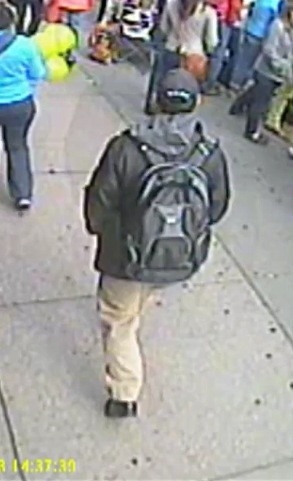 His Aunt is convinced it’s Tamerlan. Look at this image for comparison. In my opinion it’s the same guy. 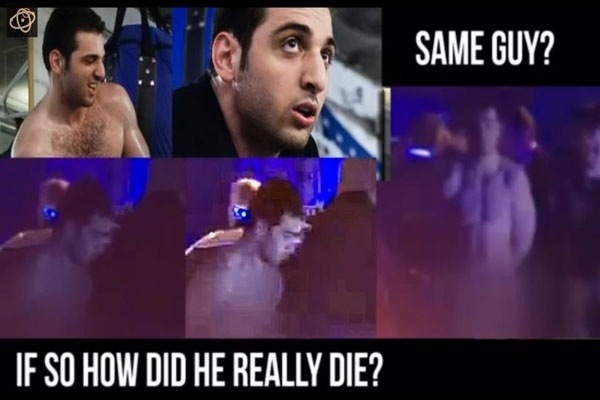 It is Tamerlan. If it is him then how did he wind up dead if he was in police custody? If its not him, why hasn’t the naked guy come forward to talk about his ordeal? 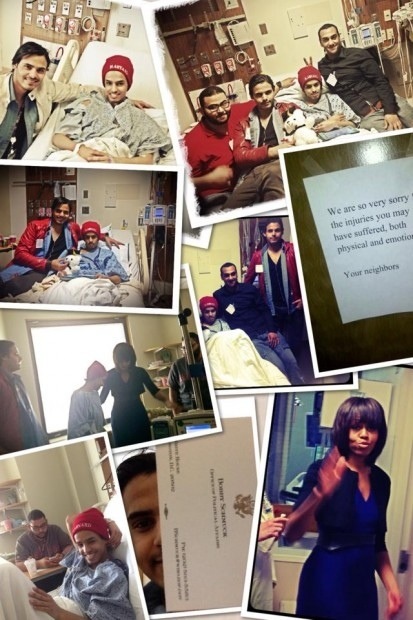 4) A Saudi student, injured at the bombing, who was in the US via a legal student visa, is going to be deported on ”national security grounds”, even as investigators found ”unusual burns” on his hand inconsistent with the injuries of other victims. He may have been a member of a Saudi clan notorious for its al-Qaeda connections. The FBI ”investigation” is suddenly dropped shortly after the Saudi ambassador in the US held an unscheduled meeting with President Barack Obama. 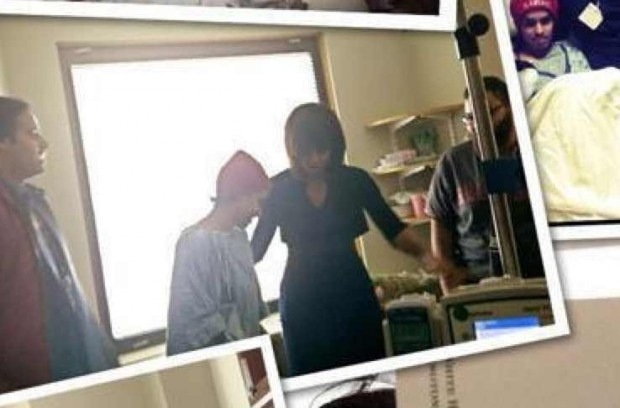 Add to it the fact that Michelle Obama visited Alharbi in hospital to check on his health in what appears to be a show of good faith to his Saudi royal connections. What exactly is going on? Is there some type of cover-up? Why was Alharbi, the initial suspect, declared a “person of interest,” then suddenly widely reported to be being deported? To which ICE (Immigration and Customs Enforcement) stated the information was “categorically false.” Janet Napolitano, in a fiery exchange during congressional hearings, refused to answer whether the information was true or not. 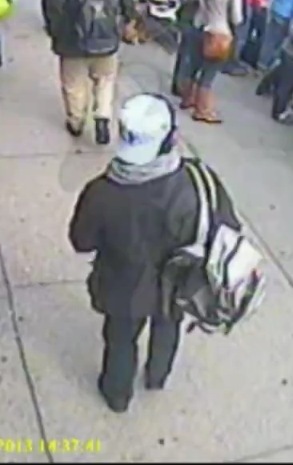 Talk radio host Glenn Beck is suggesting this is a key person of interest. He has given the Obama administration until Monday to “come clean” about the Boston bombing or he will expose what’s being hidden from the public. See here. 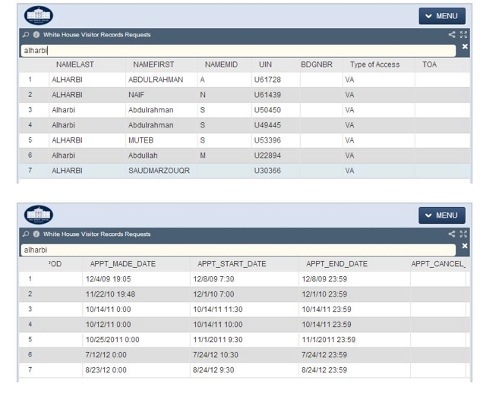 Abdul Rahman Alharbi had also frequented the Whitehouse over the years alongmwith other family members as you will see his name appear on the log below. There’s no doubt he’s being protected. But why? There truly is so much information coming out on a daily basis. The hard part is sorting it from the disinformation. Like Sibel Edmonds said in the early onset of this whole debacle the story is literally changing every day. Intelligence agencies alongside main stream media are changing the story and they are throwing so much confusion and inconsistencies and conflicting data into the mix that no one is going to figure out what actually happened. And for the perpetrators behind it all…that is exactly what they want. The door to door searches conducted by these boston police was amazing . It truly was like nazi germany and storm troopers looking for jews . I would be pissed off if these assholes ordered me out of my own home. I was puzzled by some of the boston residents reaction to being tossed out of there homes saying they are so glad police are doing there job ! ah ok what a lot of crap .